The business of fashion can be an overwhelming, but with the right strategies in place the startup process can run a little smoother. That was the focus Monday night at Wix Lounge thanks to sponsors GarysGuide and AlleyWatch, with excellent food and drinks from Qwiker Liquor, For The Gourmet, and Hint. 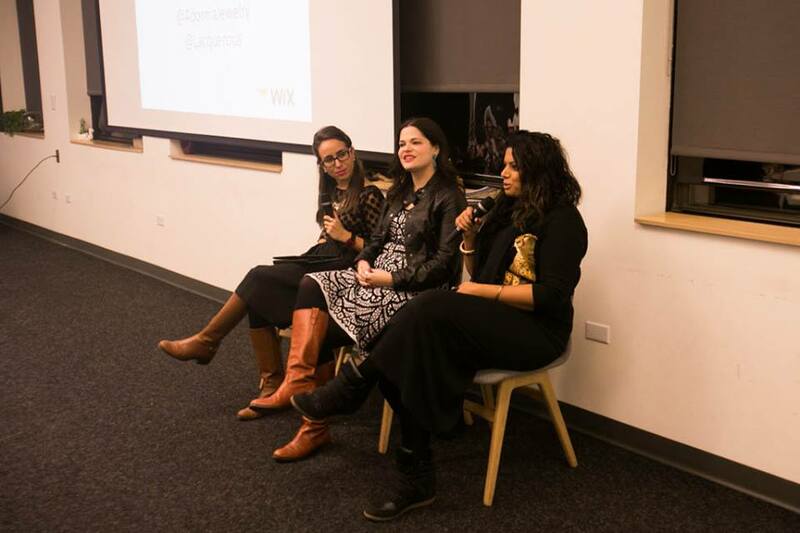 Moderated by Dalia Strum, a digital marketing expert and FIT professor, the discussion took aim at the issues facing startups in the fashion business with advice from Becca Aronson, of Adornia, and Ashlene Nand, of Lacquerous. What was even better about the conversation was that Aronson and Nand both brought years of corporate experience to the table as well. Aronson with Lucky Magazine and Redbook, and Nand with Anvil Knitwear and a current position with Gap Global Brand Partnerships, provided insight to the startup world from both sides of the spectrum, which I believe is rarely available and accessible like it was Monday night. After introductions, the evening turned to questions about branding, customer acquisition and retention, how to use social media, and getting your brand message to the world. What could be more important than those things? Determining if you should be an entrepreneur at all. Aronson and Nand seemed to agree on the importance of answering that question first, and basing it on if you want to make money and if you want to do fulfilling work. Essentially, even if media has always been your dream job and you land it, if you’re creatively left wanting, then you have to pursue the career that will make you the happiest. It may take time to realize it, but the passion and flexibility provided from starting your own business is unmatched by a 9-5 job. If nothing else, making your own decisions and engaging an audience that’s genuinely interested in your product is a rewarding experience. In fact, that interest is where your most loyal customers can be found. People don’t live in the digital world, they live in the real world. It seems like a simple concept, something that seems so obvious it doesn’t need to be said, but when you attempt to manage the beast that is social media, understanding that real people don’t actually live online is crucial to your approach. A customer could run a Google image search if all they wanted to do was look at pictures, but that search can’t provide a way to touch the product, can’t offer a hand to shake, and certainly won’t convey the personality that your brand is built on. That isn’t to say that social media isn’t important, but it does point to the second element that spanned the evening: how you spend your time and what you prioritize will enhance your company and your personal life. Both Nand and Aronson emphasized that you have to be willing to take care of yourself first, and at the end of the day, no matter what you’ll have to live with yourself. Prioritization from there is where the balance in customer engagement and brand growth will take root. More importantly, as your brand grows, you have to remember that some things don’t have to be done today while others don’t need to be done at all. Knowing where to draw that line will come with experience, but the quicker that understanding is developed, the more at-ease you’ll find yourself. Ultimately, your business is your responsibility. If there was anything to glean from the discussion it was that you must be willing to step outside of your box, learn new things, and partner yourself with like-minded people that compliment your strengths and help you navigate your weaknesses. Build your team based on your needs, but developing your brand voice is like developing yourself, it won’t happen over night, but that process will shape where your brand is heading and how it needs to be positioned. Be aggressive, be fearless, and always be yourself. You’re brand is depending on it.